Compared with the benchmark blogging platform WordPress.com, Medium is quite a sparse proposition. Whilst the mid noughties entrant WordPress has been heavily modernised in technical terms, it’s retained its traditional blogosphere feature set. There is, for example, a characteristic accommodation of user preference. Unlike Medium publishers, WordPress bloggers can disable or enable commenting (even selectively publishing comments if desired), customise the look of their pages, inject individual formatting into posts, add widgets of their choice… The list of flexibilities goes on. But more fundamentally, the focus at WordPress is still on blogging. Traditional blogging. Not part-syndication of existing articles with an inevitable promo for the “full post” hammered in. Not cynically-manufactured ‘virals’ with neo-clickbait headlines and a “buy/subscribe!” call to action taking up the final quarter. Not hastily edited originals which have gained more traction than the author expected and have thus been pumped with promotional waffle and link-strewn ‘updates’. No. The main focus at WordPress is on blogging. Just blogging. For its own sake. Whilst the content on Medium is clearly ranked and displayed according to peceived value, there is a predictability about it. As a whole, a Medium user’s feed of reading matter is almost inevitably going to prove much more readable than the chronologically-ordered content displayed in the WordPress.com Reader. But, after a short while, Medium’s predictability gets a bit weary. Successful authors will typically have a curiosity-baiting mentality and write in a calculated, if clever manner. They’ll also often be very successful in business and/or part of a ‘clique’ of staff-approved writers. A high proportion of content will come from ‘content marketers’ and have a wider goal than simply informing or entertaining. A high proportion of content will exist in its original form elsewhere online. Articles will often be deliberately abridged to bait a click to the author’s own site. Many genres will be blatantly handicapped in terms of visibility. If it’s incompatible with the paradigms of modern ‘headlining’ (curiosity-baiting), it’s unlikely to rise out of obscurity. If you have much experience of Medium.com, you’ll probably already be shaking your head at the sheer Medium-ness of those titles. “5 Remarkable Things About This”, “Ten Amazing Facts About That”, “I Heckled Bill Gates and Here’s What Happened…”. I’m not saying it’s pure clickbait. There is substance and value in high-ranking Medium posts, whereas the classic notion of clickbait is really just a title-tease leading to a valueless page. That’s definitely not the visible face of Medium. But the point is that writers who don’t conform to that predictable, Medium-compatible style are at a distinct disadvantage. On WordPress, incidentally, all of the top 20 “Poetry” results returned in the Reader stream, were poems. For me, that’s an imbalance in the opposite direction, with no analytical matter showing up at all. Additionally, some of the content displayed by the WordPress Reader was undebatably a waste of server space. Much as I loathe Medium’s preference for content marketing mores, I’d be many times more likely to actually read the “Poetry” search results on Medium than those I found on WordPress.com. 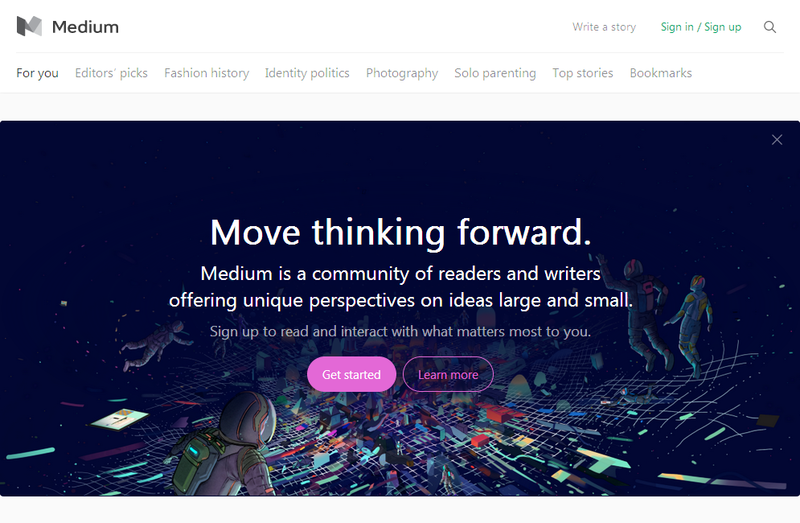 The feel of Medium.com is much more like that of a social networking site than a blogging platform. The look of each user’s page is strictly standardised, and if you don’t want reaction, your only solution is not to post. In particular, there’s a sense of the unknown with Medium, which is far less prevalent on WordPress. WordPress.com creates an effective illusion that a user’s blog is actually their own property. It’s not, obviously. But it can be personalised to the extent that it feels like it is. And the feeling of ownership is further enhanced by the WordPress ethos of seemingly everlasting user control. For example, the free WordPress.com aesthetic design themes are not retracted, so once you choose one, it remains your choice until you change it. If you change and then want to change back, the old theme is still there. Even when the themes become outdated and are retired from the current set, they remain available to those whose blogs are old enough to have feasibly used them. So if you opened a WordPress.com blog ten years ago, with the original default theme, then provided you still want your site looking like it did in 2006, it will. Whilst most bloggers would not want to restrict themselves to a ten-tear-old theme and all its limitations, this policy does instill confidence in WordPress users. It’s a statement… “We’re not gonna spring any nasty surprises”. And since WordPress.com is already sensitively monetised, predominantly through user upgrades, there’s little concern about nasty surprises in the future. Conversely, no one has a clue what their Medium posts will look like in two or three years’ time. How is the site going to make money? It must, at some point, monetise, and with the plans for that as yet unknown, concern for the future is more of an issue. Given Medium’s association with Twitter, concerns regarding redesign and ugly monetisation are perhaps exacerbated. Twitter’s record on both fronts is not good. Advertising on Twitter has become increasingly aggressive, with Promoted Tweets now finding themselves inserted into users’ profile pages in such a way that they can be mistaken for personal endorsements. Twitter ads now also accompany individual statuses on standalone display, and of course continue to infiltrate users’ main timelines. They’re in the sidebar too. And there’s still a sense that Twitter advertising might intensify further. Medium is not set up to monetise through optional upgrades a la WordPress.com. So it seems almost inevitable that it will, in due course, be blasted with ads and/or promoted content, like Twitter. That may not bother the content marketers using Medium for profile building and syndication, but it’s bound to bother real bloggers who just need one permanent base, which feels like home and looks the way they want it to look. Tricks like that do not instill trust. I know – the modern Web is obsessed with aggressive tracking, and WordPress.com is no exception. But WordPress does at least admit that it’s spying on users with Inspectlet. It’s not nice, but it’s legit. Web tech gaslighting, on the other hand, is more the kind of thing you see on scam sites. So is Medium a blogging platform? Well, I suppose if you’re the sort of person who considers LinkedIn to be a blogging platform, you could feasibly answer yes. But realistically, it doesn’t rival WordPress as a true blogger’s tool. It doesn’t even rival Tumblr in terms of creative possibilities. It has obvious biases, and that in itself contradicts the traditions of blogging. If a site is defined by the motivations and goals of its core users, Medium is neither a blogging platform nor a social network. It has little in common with Twitter, and it’s certainly no relation to Hubpages. What it really is, is a content marketing platform. There’s nothing wrong with that. But be aware of the site’s business, aspiration and commercial sector bias, and the calculated writing/presentation style that commonly succeeds. Because of the attention Medium has paid to prioritising material of value, it does (arguably contrary to WordPress.com) have a natural internal audience with a serious interest in the content. Therefore, as a content marketing tool, it is very useful. Will it still be as attractive to content marketers in five years’ time when the posts are perhaps peppered with low-end ads? That remains to be seen. But accept it for what it is, rather than what it’s commonly billed as, and Medium.com has a lot going for it in its current form.